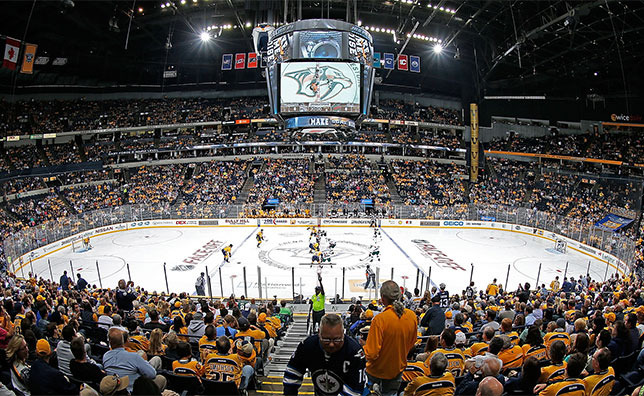 Bridgestone Arena, home to the Nashville Predators announced plans this week to install an Ephesus Lighting light-emitting diode (LED) system in time for their NHL home opener on Sept 20. This makes it the sixth National Hockey League home ice facility to upgrade their venue in order to provide improved illumination, save money and help the environment by way of the installation of 120 LED fixtures, replacing the existing 247 metal halide fixtures used over the past 17 seasons. Read further about Ephesus clients including, the University of Phoenix Stadium, home to last year’s Super Bowl 49, the new Minnesota Vikings stadium, and colleges and other facilities. NHL All-Star Game 2016 will be played under new LED light tech at Bridgestone Arena sure to enhance the fan experience. Ephesus Lighting is considered the digital lighting solutions developmental leader for sports arena, stadiums and fields regardless of size. Home ice for the Nashville Predators and host of the 2016 NHL All-Star Game to improve the in-arena experience for fans, players, broadcasters, viewers and facility operators. The Nashville Predators are the 27th team to play in the NHL. The team is led by the only general manager in franchise history, David Poile, two-time Jack Adams Finalist and Stanley Cup-winner Peter Laviolette, and is anchored by three-time Norris Trophy finalist Shea Weber, three-time Vezina Trophy finalist Pekka Rinne, and a blend of rising young talent and experienced veterans. Bridgestone Arena is located in downtown Nashville and operates as a multi-purpose building. Since 1998, the Predators have hosted NHL games in middle Tennessee, providing the community with engaging fan experiences, a festive atmosphere and one of the South’s most competitive venues. The arena earned the Pollstar 2014 Venue of the Year award. It has hosted other major events such as the SEC Men’s and Women’s Basketball Tournament, the Country Music Academy Awards and concerts by top entertainers. 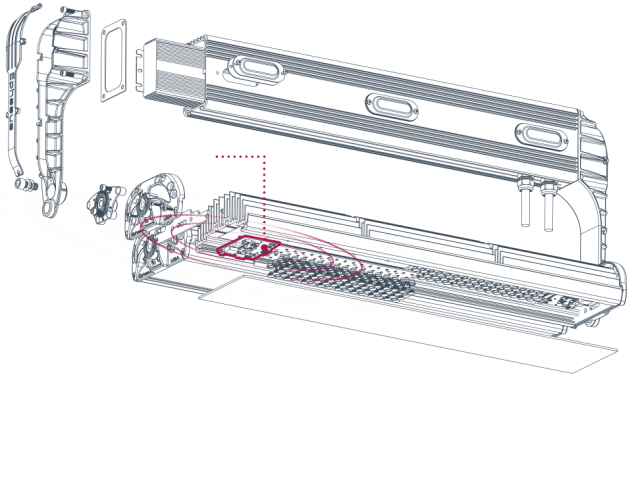 The Predators new lighting structure and tech creates out of the box thinking opportunities. “[LED] makes everything brighter, the ice whiter and the colors pop out more,” Julien BriseBois, assistant general manager of the Tampa Bay Lightning, according to Sports Illustrated. “It is easier to track the puck and easier to track it in the air.” As a result, the fan experience is optimized, video streaming is easier to watch live in person or on TV and digital devices, and hockey stats should improve. “That’s true for fans sitting in mid-level seats as well as players digging it out of corners that are no longer shrouded in shadow,” said BriseBois. Athletes and entertainers benefit from LED lighting because it takes less time to fully power on compared to the metal halide lighting system in place. Dimming controls allow operators an instantaneous from a scale of zero to 100 and include a wide range of adjustable color temperatures and options. Consistent (unflickering) light from the LED enable the lights to be seen by the naked eye unlike metal halide fixtures still operating in most sporting venues. Kohl gave an example of painting the ice with purple light during intermissions of the Hockey Fights Cancer game or a more inspiring national anthem ceremony – because with the Ephesus LED lighting system they can make it so. LEDs will improve bowl lighting and so will outdoor fixtures mounted on the front lip of the arena. Management has marketing plans to transform the bulb color to gold for the Golden Saturday program. Ephesus Lighting has pioneered the acceptance of LED lighting at sports and entertainment venues across North America by engineering LED lighting solutions that provide a significant increase in illumination when compared to all other lighting systems. Ephesus’ LED lighting is brighter, and through its industry-leading glare-control innovations, its fixtures shine more uniformly on the playing surface, creating a better stage for players and fans both in the stadium and those watching on high-definition television. The versatility of LED also allows for operational flexibility and the creation of programmable light shows for fan entertainment. Ephesus LED solutions are easy to install, maintenance-free for years and offer facilities the lowest total operating costs. Ephesus Lighting luminaires have been operational for over 20 million hours at indoor and outdoor sport and entertainment venues across North America including; University of Phoenix Stadium, the Canadian Tire Centre, Duke University, Cornell University and many more. Sports Techie, Preds players, fans, sponsors and Bridgestone Arena all benefit from the installation of Ephesus Lighting fixtures because LED lights enhance the in-venue fan experience, TV clarity and sponsorship ROI while saving money and helping the environment. The NHL AllStar game 2016 will shine like never before in person at Bridgestone Arena, streaming on your new iPad Pro or while watching on an OTT box in place because of the cable you cut, thanks to the venue upgrade to CREE LED lights and Ephesus Lighting fixtures. Now Bridgestone Arena really toss out a Performance Puck because it will be easier to see for all. The Bridgestone performance puck and Predators will play under LED lighting beginning next month so enjoy all the new technology, infrastructure and service upgrades when you attend Smashville or watch games over NHL Network. Keep up the green and sustainable innovations everyone.